Are you looking for a dollhouse for your boy? 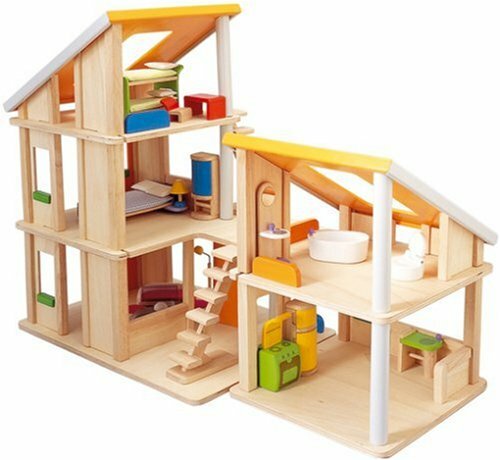 Find out how to choose the best dollhouses for boys and see the great selection of high quality houses. Dollhouses are great for boys who like to use their imaginations. They get a chance to play house, in miniature! We are compiling a gift guide for boys page so be sure to check that out for other great gift ideas for boys. There are a lot of choices out there and not all of them are well-made. I’ll narrowed down the choices to the best, high quality dollhouses that will last for years. Think about your boy first and foremost. What type of house would he enjoy? A more stereotypical boy dollhouse or a general house? Buy a wooden house. I cannot emphasize this enough. They last longer and can handle rougher play. Wood is the best material choice for a high quality house. Decide if you want a furnished house or want to pick your own accessories. Think about where you are going to put it and choose the appropriate size. We had ours on the floor but some like to have it on a table. Choose a house that you won’t mind having sitting out. Leaving it out encourages a lot more play time. Consider if you want to hand the house down. If you plan to keep the house for a long time–buy a high quality dollhouse. Decide if you are going to purchase dolls to fit the house or if you are going to use your own dolls. Make sure the house will work with the dolls you want to use. The Kidcraft Fire Station set is sure to be a hit with boys who love all things about fireman and firetrucks. This house has two bendable fire fighters, beds, a dog, a firetruck and a even a neat helicopter! 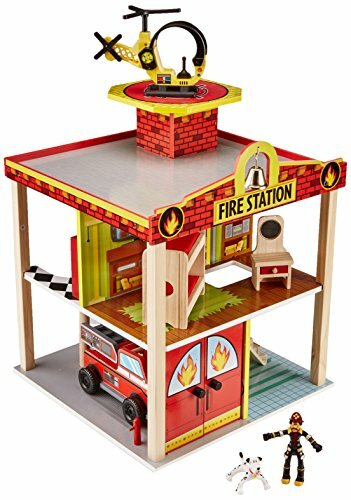 The Fire Station Set is made of wood and is very sturdy. I like how open it is as it makes it easy for them to get their hands in to play with the furniture and park their fire engine. FYI, it is discontinued by the manufacturer so if you want it you need to buy it soon. It has 3 firemen, a garage with a fire engine and a ambulance, 22 pieces of furniture! Plus a cute dog. You can’t beat this wooden dollhouse that is sure to be played with for years to come. 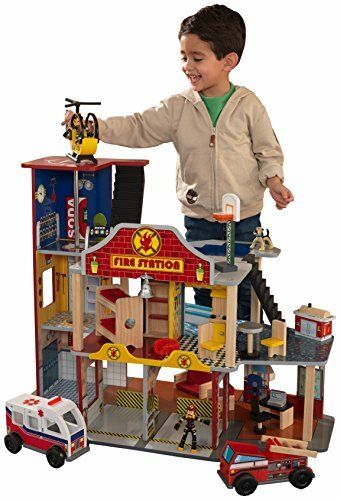 These fire station sets make a great dollhouse for toddler boys choices. 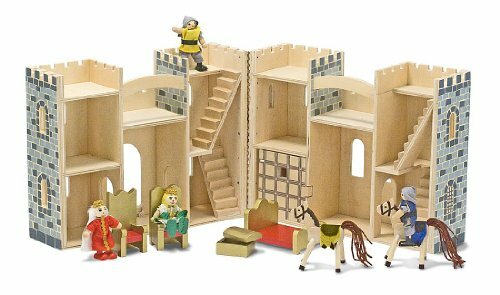 Melissa & Doug Fold & Go Wooden Castle If you are looking for an inexpensive, compact dollhouse try this wooden toy house for boys, the Melissa & Doug Fold & Go Wooden Castle. It folds up for easy storage. This is a nice take-a-long house for trips or to take (or keep) at Grandma’s house. 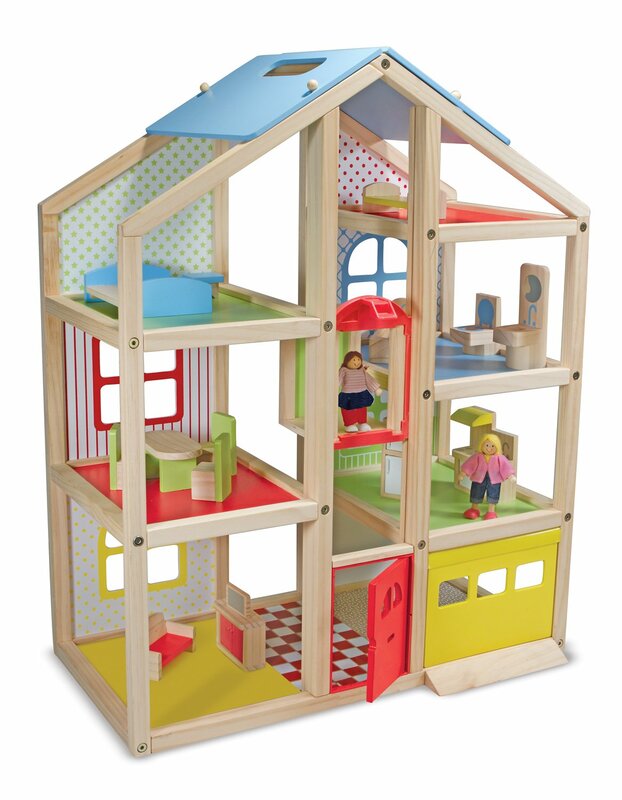 This fun, colorful dollhouse is a great choice. It is called an All Season DollHouse and has a nice style to it. The rooms are easy to access and it comes with a lot of furniture. It is made of light weight woods and is not quite as sturdy as our top choice below but it is more affordable and comes fully furnished. You only have to add dolls and you will have a great setup. 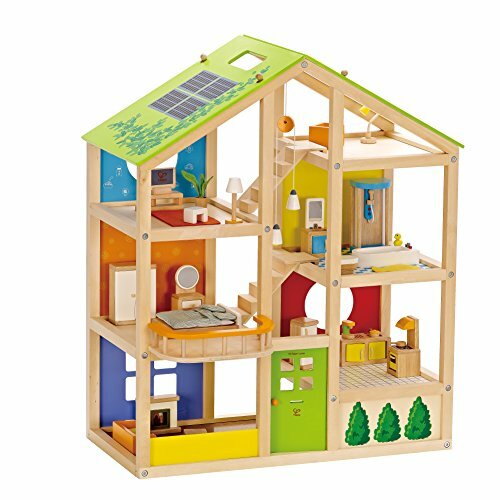 Small World Toys Wooden Doll House For a natural finish toy house that has a very open design go for the Small World Toys Doll House. It is 3 stories high and is made of wood. If you, or the person you are buying for, likes a plain dollhouse so the kids are left free to use their imaginations this is the perfect choice for you. 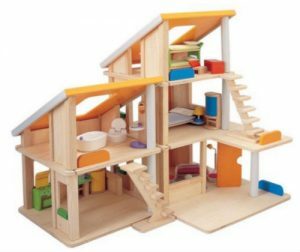 Melissa and Doug Hi Rise Dollhouse Colorful, and well-made, the Melissa and Doug Dollhouse is a wonderful choice. It is made of wood, is 3 stories high, includes some furniture, 3 dolls and even has a neat elevator! To fix that issue, you can simply purchase this car and doll set to go with it. It is still a very good value and they have a car to put in the garage! Plan Toys Terrace Dollhouse This is the brand of dollhouse that we own. 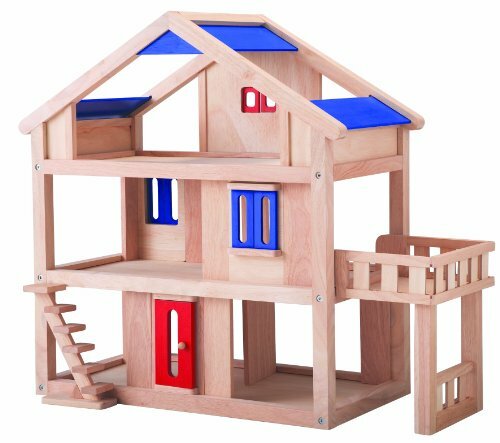 Plan Toys makes a sturdy, high quality wood dollhouse that is nice enough to hand down. We have a model which is very similar to The Terrace Dollhouse and I have been very happy with my purchase to this day. You will get a lot of years of play out of this beautiful wooden dollhouse and can keep it for your boy’s children to play with. You will need to purchase a Doll Family and furniture and accessories to go with it. We bought this additional set because it is so cute and it used a lot! Plan Toy Chalet Doll House with Furniture They also make a stylish furnished model if you would rather just get everything at once. The furniture and accessories that come with this house is of high quality and will last even with a bit of rough boy play. I like that it has bright colors – no pink in sight! It is also open enough that boys can get their hands into it. The doll house come with 2 units so you can move them around to configure different setups. Dollhouses are great for boys. I bought a great wooden dollhouse and it was the best purchase ever. We spent a ton of time making up stories or continuing long, drawn out, delightful stories of the family who lived there. If you need another reason to buy . . . you will have fun too! I know I did. Buying a dollhouse for boys can be a bit overwhelming. 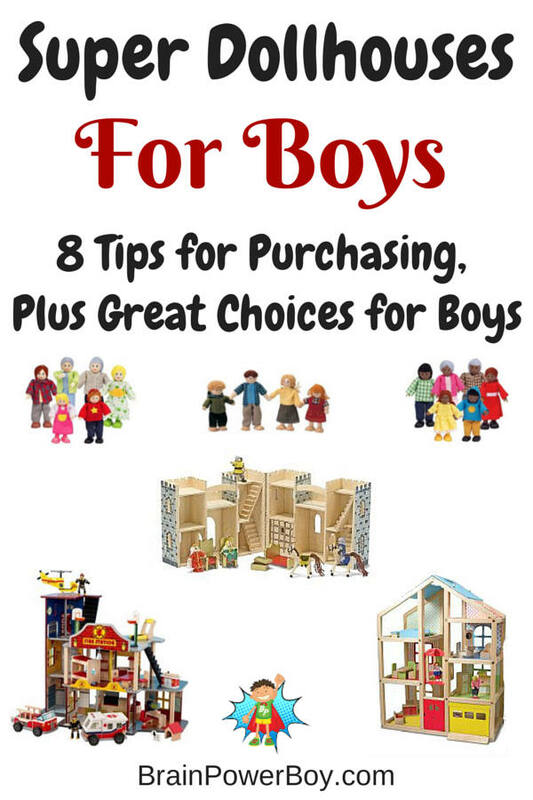 There are a lot of choices out there and you really need to think about the boy you are buying the dollhouse for and how he will play with it before investing in a dollhouse. Scroll down for more dollhouse choices. We added to our dollhouse as we went along. Every now and then we would get another accessory set or some additional furniture. These made nice gifts and kept the dollhouse play going for a long, long time. Purchasing a wooden dollhouse for boys is a good investment. There are some many opportunities for open-ended play and imaginative storytelling. Don’t listen to others when they question your idea of buying your son a dollhouse. It is a wonderful toy for boys. 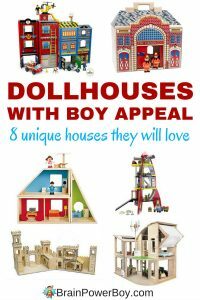 I hope you enjoyed taking a look at the dollhouse buying guide and the list of great dollhouses for boys. Need even more choices? Check out our unique dollhouses article! Includes Pirate’s Cove, Heroes House, Rocket Ship and other cool choices. My daughter has a gorgeous doll house that I helped to look like our own house. I used left over paint from our own rooms in our house, and I stuck “carpeting” and “flooring” down with scraps. It looks almost real! My boys prefer nerf guns. I loved dolls growing up. My guys would love the fire rescue center! They really like Octonaut figurines and Playmobil too:) This is a great list! I like that fire rescue center myself! It is pretty neat. Playmobil is a big deal here and I love it. These are great ideas! My son loves his action figures, they totally need a house! Thanks for stopping by. We have had a ton of fun with our house. I want a dollhouse for the Ken Barbie doll with masculine accessories are there any such things?